Manchester United the most successful football club of Europe also holds one of the highest wage bills of Europe as the annual revenue of this football club almost exceeds £615 million and this gross amount includes £50 million profit for the club. Red Devils spend most of their money on buying some expensive players from transfer market. The wage bill of Red Devils likely increased after they recruit Pogba and Ibrahimovic in their squad. Manchester United back in 2016-17 seasons had spent huge bid of £116 million while bringing Paul Pogba, Henrikh Mkhitaryan and Eric Bailly in their playing squad. In current season Red Devils offload number of players from their team and their annual wage bill drops down to £203 million from £2015 million but still Man United is one of the richest football club touching their wage bill near to their old rival Manchester City Chelsea who spent £200 million wage bills in current season. During season 2017-18 Manchester United spent £147 million and transferred three players in their team including Romelu Lukaku, Viktor Lindelhof and Nemanja Matic. One of the most expensive signing of Man United is with Paul Pogba who entered into the squad of this club on annual salary of £ 290,000 whereas United also singed Fred for £59 million. Manchester United have made three big transfers before jumping into new season. 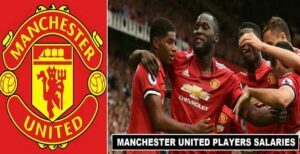 As their signed Romelu Lukaku for £75 million, Namanja Natc for £36 million and Victor Lindolef for £31 million and the transfer spending of Manchester United will shy to £200 million mark at the end of this season. Red Devils with some record performances in Premier League earned massive profits and the total revenue of this club touches down to £615 million which includes £318 million commercial revenue, £152 million Broadcasting revenue and £232 million wage bills.